New from MAR-K Quality Parts is a complete 11 piece aluminum moulding set that accents the lower body lines of the 67-68 GM Suburbans. These are bright anodized aluminum with the black painted accent stripe as original. Moulding pieces are also available separately, including the previously unavailable lower "third door moulding". Made by MAR-K in Oklahoma City, USA. 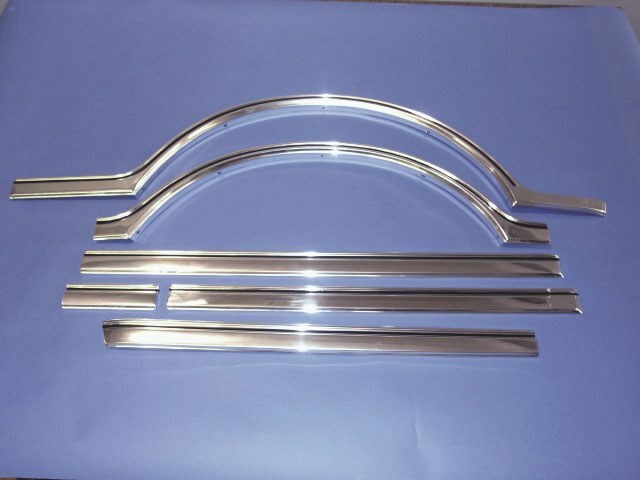 Mar-K maintains stock of many of the hard to find stainless and aluminum mouldings for the 55-59 and 62-72 GM Pickups. Mar-K also manufactures a wide assortment of restoration and custom bed parts for GM, Ford and Dodge trucks. For further information, contact MAR-K Quality Parts at 6625 W. Wilshire, Oklahoma City, OK 73132 by phone at (405) 721-7945, fax (405) 721-8906 or visit our website at www.mar-k.com.